1. Enter the dates you wish to stay in the search bar and select the apartment you'd like to rent from the list. Follow the steps online to reserve the apartment. For stays of 1-11 months you can reserve directly online. For reservations of more than 11 months, please contact us with the reference number of the apartment you wish to rent and we will inform you of the rental terms and conditions, and confirm the availability of the apartment. 2. You may also wish to visit the apartment or request more information before making your reservation. In this case use the contact form on the apartment page to request a visit. 3. For stays of more than 31 nights we will need you to send us the necessary documentation as outlined below. 4. For stays of more than 31 nights, the acceptance of reservations will be subject to a tenant check. AB Apartment Barcelona will inform you if you have been successful in your request for a rental within 48h. IMPORTANT: In case of cancellation, no refund will be made on the agency fee or the first month’s rental amount. Cancellations must be made in writing. Linens and towels are included in the rental price for stays of up to 11 months. For stays of more than 11 months we may provide a set from 40€. The apartment must be fully cleaned once the rental period is complete. The charge for this must be paid by the tenant. The price is determined by the size of the apartment in m2. You will be charged a minimum monthly rate for utilities such as gas, electricity, water and Internet according to the size of the apartment: 1 bedroom – 120€; 2 bedrooms – 200€, 3 bedrooms – 250€, 4 or more bedrooms: 300€. At the end of your stay we will check the bills and if there are any outstanding amounts that have not been covered by your monthly payments we will deduct these from your deposit. We provide a maintenance service for the apartment and we will resolve any problems which may occur during your stay. If the problem is a result of a misuse of the apartment or anything inside it, you will be charged for any repair or replacement costs incurred. For stays from 1-11 months, payment to confirm the rental can be made online by credit/debit card, PayPal or bank transfer. For stays of more than 11 months, payments must be made by bank transfer, unless another form of payment has been agreed upon with one of our agents. IMPORTANT: Bank transfers must be made only after confirmation that the reservation has been accepted. 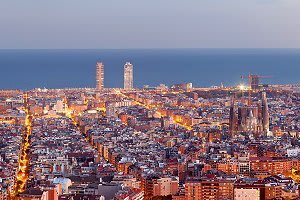 IMPORTANT: Once the transfer has been made, please send the proof of payment, indicating the reservation number and the name of the tenant, to the following email address: accounting@apartmentbarcelona.com. The deposit will be returned within 31 days of departure, once any necessary charges for utilities, damages and the cleaning fee have been deducted. You will receive a confirmation email detailing where you need to go to collect your keys. This will either be our 24h Check-in Office or our Long-Term Rentals and Sales Office, depending on the length of your stay. We have two rent options for businesses. Not every business owner is legally able to administer invoices. Speak to us and we will tell you about the terms and conditions of the property that you want to rent. You should supply us with the name and the ID (identification number) or the passport of the tenant, so that the information is recorded in the corresponding part of the contract. Renting carried out by a business on the behalf of an employee, is exempt from VAT and is not subject to withholding. These invoices will be administered under the name of the business, but with 0% VAT.